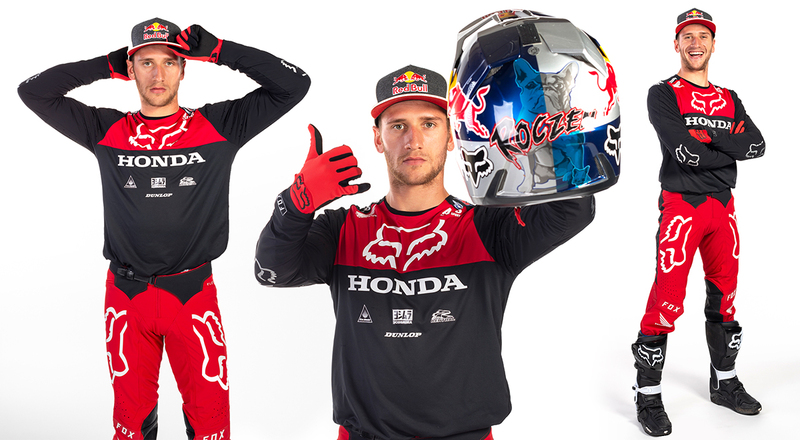 After two rounds of the 2019 Monster Energy AMA Supercross an FIM World Championship, HRC Honda’s Ken Roczen will carry the 450SX red plates into the first Triple Crown event of the season at Angel Stadium of Anaheim. For core fans, those who know what Roczen has been through, that sentence is as dramatic as it gets. Just reading it should make the hair on the back of their necks stand up. For the uninitiated, there is the story of his heroic comeback that needs to be told. Fresh off of a lucrative new contract with HRC Honda Ken Roczen enters the Anaheim Pre Season Press Conference in an Acura NSX wearing a suit. Bold, flashy and oozing with confidence, Ken was a stark contrast to every other rider that sat behind their mics that day. He would go on to dominate the opening round of the championship and follow it up with another victory in San Diego a week later. Heading into Round 3, the world was his. With the red plates attached to his CRF450R, Ken was confidently poised to win his third victory in a row when disaster struck. In a millisecond Roczen’s life was about to change. His infamous crash has been seen by millions around the world, and left a painful reminder of the brutality of the sport. More than that, it almost ended his career. After 11 operations, Ken was ready to begin an arduous comeback. He would continue to fight a battle most would have abandoned. Roczen climbs back aboard his machine and whispers begin to circulate that not only is his career not over, but he is riding with the same speed he carried before his demise. Videos leaked, stories hit national media and as the 2018 season began his return sent an electric charge throughout the sport. Ken would post the fastest time in 450SX qualifying at the opening round. The stories were for real. Not only was this a comeback of epic proportions, but an almost mythological realization that this man was not only back, he was ready to win. In front of a sold out Angel Stadium Ken Roczen was introduced with punk rock band Pennywise’s “Bro Hymn” blasting through the stadium. It was one of the most electric moments in Supercross history. He would go on to finish 4th in the main event. Short of his goal and visually dejected after the race, being his own harshest critic didn’t nullify the fact that he had accomplished the impossible. And in the next few weeks the No. 94 would heat up. He landed a podium finish at Round 2 and returned for Anaheim 2 with the demons of 2017 weighing heavy on his shoulders. He faced those demons dead in the eyes and wore the same styled and colored riding gear from his 2017 crash. It didn’t work. It was the first Triple Crown event in Supercross history and Ken struggled with poor starts and rode flat. The fire wasn’t there. Sometimes, the nightmare wins in a mental battle. Roczen would return to the podium the following weekend in Glendale. One week later, it was time for the German to win in Oakland. He was one lap away from finishing his masterpiece when Jason Anderson passed him. The Cinderella story would have to wait. He was so close and surely victory was coming soon. The following weekend in San Diego would produce another disaster. This time, Roczen collided with Cooper Webb and the crash sent his right hand into the spinning rear wheel of Webb’s machine, another implausible injury with severe consequences. The result was a badly broken right hand and his comeback story was over. In two seasons of Monster Energy Supercross, Roczen had only raced in 9 out of 34 possible main events. Another new season. Another comeback story for Ken Roczen. 11 surgeries on his left arm, and a half dozen on his right hand. Would he be able to hang on? Could he rise again? In the pre race press conference these questions were asked to which he replied, “My arms are stronger than ever. I feel like the injuries never happened.” Ken would go on to win the first 450SX Heat Race of 2019. He was for real. He was fast and would take the No. 1 gate pick for the 450SX main event. With the rain coming down Roczen charged in the top five off of the start and systematically began moving forward. He would come up a scant three seconds short of race winner Justin Barcia, finishing runner up. Last weekend the table was set. Roczen grabbed the holeshot and raced away with a four second lead over Jason Anderson. The same man that stole victory from him a year ago in Oakland. They were a third of the way through the main event when the race was stopped for an injured Malcolm Stewart. On the ensuing restart Ken couldn’t find his rhythm and Anderson moved in to attack. He would do just that and launched to the inside of Roczen, made contact and took him down. Once again a seemingly sure victory was snatched away. Roczen would finish 3rd, but take over the 450SX point lead. The red plates are back on the No. 94. Enter this weekend. January 19, 2019. Round 3 of the 2019 Monster Energy Supercross Championship has not been kind to Ken Roczen. A potentially career ending injury in 2017 and a dismal 9th last year. That said, something feels different about this time. He hasn’t been flashy, rather consistent and steady. Is he more wiser and more measured to his approach to the race? Does he do it at the Triple Crown this Saturday night? Can the comeback be complete? This is the biggest story in the world of motorsports and may be the most inspiring in any sport. Can he carry the fire and finish his masterpiece? Like the mythological Phoenix, Roczen has risen and fell only to rise again. Judgement night for a true hero! Follow his journey at A2!